You don't need a miracle to walk on water - follow the aqueduct up to the Blackwater Dam in the hills above Kinlochleven and thousands of gallons pour down below your feet. The town here owes its existence to the aluminium industry. The factory was constructed along with the dam and powerhouses between 1904 and 1909. The dam itself is 3,112 feet long - just over a kilometre - and 86 feet high. When it was built it was the largest structure of its kind in Europe. The reservoir behind it draws water from 60 square miles of hillside with an average annual rainfall of over 100 inches. The factory closed recently but the site is being redeveloped with a mix of small business units and outdoor recreation facilities. Set off from the public toilets by the main road bridge over the River Leven. A single track stretch of road skirts round the edge of the works, taking you to the base of a set of huge black pipes. These bring the water down from the dam to a hydro-electric plant which was used to power the factory. The tarmac road quickly gives way to a track across the base of the pipes. It rises steeply on the right hand side, following them up the hillside. You are now on the West Highland Way, on a track used to service the dam. The way rises steeply for a time before flattening out towards a bridge over the Allt Coire Mhorair, and, above it, a reservoir that provides Kinlochleven with its water supply. Once over the bridge, be prepared for another gruelling uphill stint. A couple of tracks branch off on either side of our route, which is marked with West Highland Way posts (a thistle in a hexagon). A small cluster of buildings marks the end of the uphill slog. Continue on the track past the cottages. Adjacent to the way at this point there runs a concrete aqueduct used to bring water from the reservoir to the top of the pipes. The Blackwater Dam soon looms into view. It's an impressive sight, a giant wall of concrete stretching across the head of the glen. 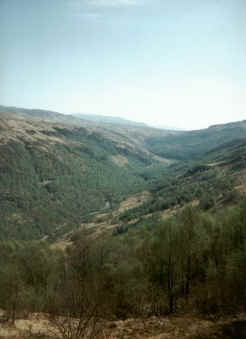 The West Highland Way branches off on the right and as you get nearer to the dam, a small graveyard (pictured, right) can be seen down to the left. It was here that men and women who died in the massive construction project were buried. The headstones are simple slabs of concrete and while most have names, some are marked 'Not Known', such was the transient nature of the workforce which consisted largely of Scots labourers and Irish navvies. Some perished in accidents on the site, while others fell victim to the elements as they made their way between the dam site and the Kingshouse Hotel on Rannoch Moor, the nearest watering hole. It is not possible to cross the dam itself, so the best course of action is to ford the outflow a little way downstream. At several points, particularly between two large pools, there are narrow channels and conveniently placed stepping stones. Once safely across, head up over the grass and heather to join a well-made path descending from the north end of the dam towards Dubh Lochan. It follows the River Leven down the glen and, to your left, there are beautiful little lochans and spectacular waterfalls, all lined with silver birch trees. The path is, on the whole, excellent, although in one or two spots it is slightly eroded and, just before the Allt na h-Eilde, marshy. A substantial bridge spans the Allt na h-Eilde and, on the other side, the path disappears into woodland, emerging briefly before Kinlochmore. It skirts round the edge of the town and brings you out into a small housing estate. The streets all fan out from a central point from where a pathway runs along the river bank and brings you out by the road bridge over the Leven. Start Public toilets, Kinlochleven (grid ref NN 192620). Parking Free car park opposite the nearby shops. Grading Track and path throughout, with exception of short point beneath the dam where stream has to be forded. Some steep sections early on. Dogs should be on the lead in places due to sheep grazing.